Compressive strength is a vital factor parameter to find out the performance of the material throughout service conditions. Complete strength of a structure like flexural resistance and abrasion are directly based on the compressive strength of concrete. Compressive Strength of concrete is described as the Characteristic strength of 150mm size concrete cubes which are examined at 28 days. The concrete attains its strength quickly til 7th & 14th Days. Then progressively enhances from there. Therefore, the strength can’t be anticipated unless the concrete arrives to that steady condition. 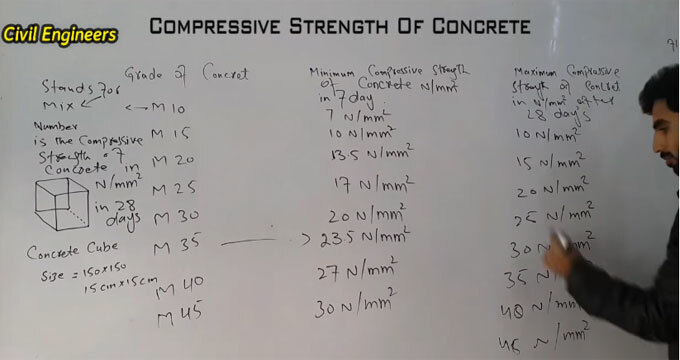 With the help of compression test, the strength of hardened concrete is calculated. The compression strength of concrete determines the capacity of the concrete to withstand loads which prioritize to compress it. The necessity of the compressive strength of concrete fluctuates from 2500 psi (17 MPa) for residential concrete to 4000psi (28 MPa) and greater in commercial structures. Greater strengths up to and surpassing 10,000 psi (70 MPa) are set for specific applications. Compressive strength of the concrete is depend on the Grade of concrete. Because different Grade of concrete his different compressive strength in 7 days 14 days or 28 days etc. Concrete grades are represented as M10, M20, M30 as per their compressive strength. The “M” stands for Mix design of concrete that is accompanied by the compressive strength number in N/mm2. “Mix” refers to the relevant material proportions ranging from Cement: Sand: Aggregate Or Cement: Fine Aggregate: Coarse Aggregate. a. Prior to commence construction work, the compressive strength of concrete should be examined in various days. b. For this purpose, the concrete cube should be formed with the size 150 mm x 150 mm. c. The concrete cube should have been totally vibrated and curing. Then, it will be possible to determine the compressive strength of concrete in compression machine. It should be noted that concrete cube should have been vibrated and completely curing with water to obtain the desired strength that is necessary for any grade.